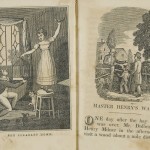 As part of the Sheila R. Bourke Collection of Chapbooks in McGill University, there is a 6-part series by author Mary Martha Sherwood based on her children’s book History of Henry Milner (1837). 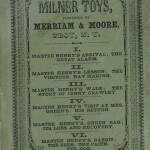 According to the advertisements on the back cover of these chapbooks, the series is also referred to as the Milner Toys series. 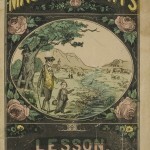 Mrs. Sherwood is a prominent author of many chapbooks and children’s literature of McGill’s collection and is claimed to be “one of the most significant authors of children’s literature of the nineteenth century”1. 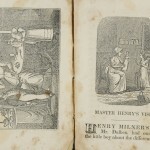 Alongside her works such as The History of the Fairchild Family, the Milner Toys series relates the theme of childhood within domesticity and religion by taking readers through the life and lessons of the fictional character Henry Milner in 19th century England. 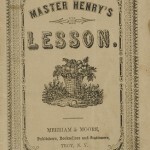 * Rare Books and Special Collection holds 2 versions of the second chapbook, Master Henry’s Lesson, the second published in the year 1851. 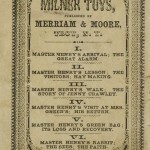 Naturally, the chapbooks in the Milner Toys series share a structure that include a cover with a simple title, a title page, followed by a frontispiece, a few narrative sections, and the same advertisement on the back cover. 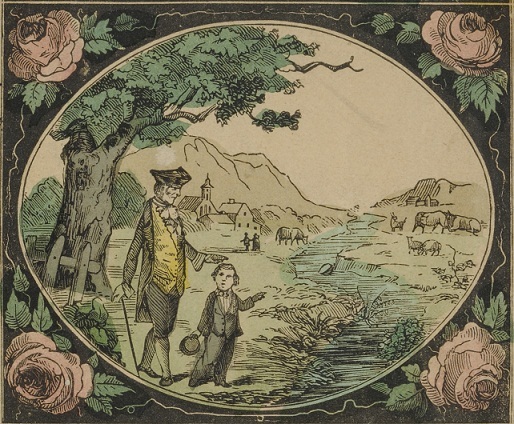 Interestingly however, some of their similarities are not consistent across all 7 chapbooks. 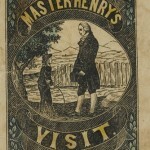 For example, 4 of the 7 chapbooks share the same image of a man with a young boy on the cover. 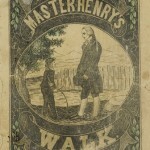 The chapbook published in 1851 consists of different image of a man with a young boy walking in a field. 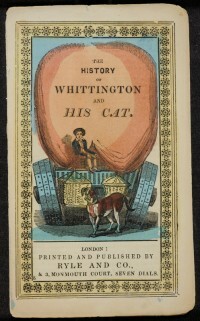 The other 2 have, what seems to be, a fruit basket on the cover instead. 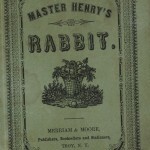 Although the cover of each chapbook includes one main title, the title page includes the titles of the other sections as part of the content of the book. 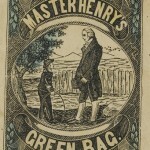 Each section begins with the same style lettrine, also known as a drop-cap. 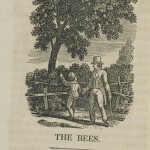 Each chapbook includes numerous woodcut engravings within the text. 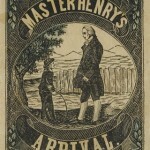 Some of the illustrations are done by Alexander Anderson. According to the McGill note in the catalogue, coloured illustrations were completed by hand.